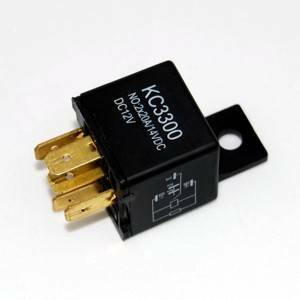 Description: KC HiLiTES 3300 12 Volt Relay - 5 Pole is standard equipment for all KC HiLiTES 12v Light Kit Applications. Relay uses 5 poles and is sealed for added moisture protection. For use with 12v Applications only. Description: KC Hilites 6316 Add-On Wiring Harness features a relay for use in conjunction with KC #6315 Relay Harness Kit, allowing you to wire and operate two additional lights to power from one switch. Includes 40A relay without a switch. 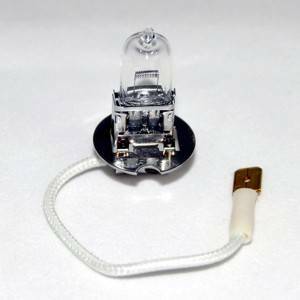 Description: KC's 12V H3 Halogen bulb is a standard equipment replacement bulb for all of KC Hilites 55w applications, using brilliant clear quartz provide brilliant, super bright light from your halogen lamps. 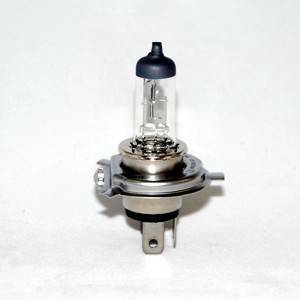 Description: KC's 12V H4 60/55w Halogen bulb is a standard equipment replacement bulb for all of KC Hilites halogen H4 headlights, clear quartz provide super bright, OEM grade dual filament H4 bulb offers 60w High and 55w low beams. Description: KC's 12V H3 Halogen 100w is a standard equipment replacement bulb for all of KC Hilites H3 100w halogen headlights, clear quartz provide super bright output. 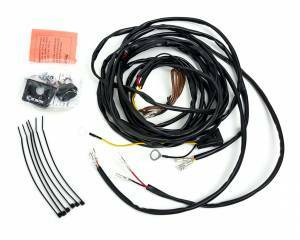 Description: The KC 63082 Universal Wiring Harness with matching connectors is designed for the wiring and operation of two Cyclone LED lights. 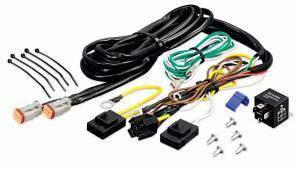 Complete with 40A Deluxe wiring harness, switch and hardware necessary for installation. 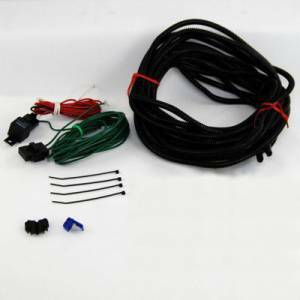 Description: KC Hilites 6309 Wire Harness for KC 517 Back-Up Flood Lighting System. 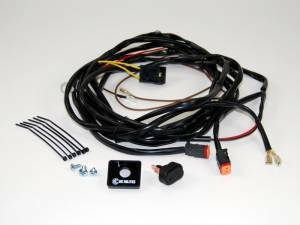 Description: KC Hillites 95602 12v HID thin wiring harness for 50w or 70w KC HID lights. Operates 2 HID lights, does not include HID ballast. 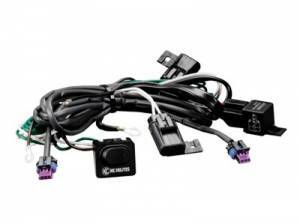 Description: The KC 6308 Wiring Harness with 2-Pin Deutsch Connectors is designed for two lights up to 55w each (Maximum 110w total). Weather proof sealed, including 30 amp illuminated Switch with panel. Relay not required. 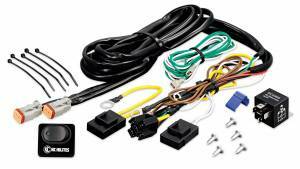 Description: KC Hilites 6315 Relay Wiring Harness Kit allows for quick installation for up to two 130w lights. Harness complete with 40A relay, illuminated rocker switch kit, fuses and mounting hardware to handle up to 260w.